But that moment is more than just a punchline. It also reveals three big problems that face anyone looking for high-quality healthcare — for a real Top Doctor — when they need medical help. The cash-for-credentials exchange is pretty galling. For less than a hundred bucks, Allen could cement his ‘reputation’ as a Top Doctor in America. “If you look at these [award] methodologies, they are rife with economic and relationship biases,” he said. He calls them “vanity awards” — an insult to patients who deserve better information about where to go for care. Blatant as it is, though, this exchange only scratches the surface of the warped economics behind many popular physician ratings. The awards companies aren’t the only ones collecting. Any award — whether reputable, fraudulent, or somewhere in between — can be hugely valuable to doctors and hospitals. In the case of Top Doc awards, undiscerning consumers who see them (ever spot those ads in an in-flight magazine? ), assume there must be something behind it. As a result, Top Doctors and Hospitals see big upticks in patient volumes and, therefore, revenues. Even for the most conscientious of providers, that makes these awards hard to refuse. It’s in their economic interest to accept and promote them, even if the awards don’t mean very much. It puts competitive pressure on providers to become award-accumulators. There isn’t much to stop them, save their own sense of ethics. As the proliferation of these awards shows, that’s not always enough to keep these awards off of doctors’ shelves. The incentive issue might not be so bad, if these awards had the slightest bit of rigor behind them. But Allen’s story proves you don’t even have to be a doctor to win one. Obviously, there are bigger issues than biases in the methodology. To find out what goes on behind the curtain, Allen asked a few of these award companies how they approached their analysis. What he got was a lot of hesitation and backpedaling. “It’s just a listing people can go to for a start. We never say you should go to this one,” said the research director for Minnesota-based Super Doctors. “I guess in the world it’s hard to find the absolute best [doctors]. It’s all through reputation and interpretation,” said the owner of a company that places those ‘Best Doctor’ ads. Now, we at MPIRICA will be the first to tell you — healthcare quality analysis is really, really hard. But that’s no excuse to lean on “reputation and interpretation” to figure out who offers good care. As we’ve covered before, those factors won’t help anyone. Reputation and reality don’t always line up. Big-name institutions, with sterling brands and prestigious awards, can still produce sub-par outcomes. True quality analysis goes beyond reputation, and looks at what really affects patients: healthcare outcomes. 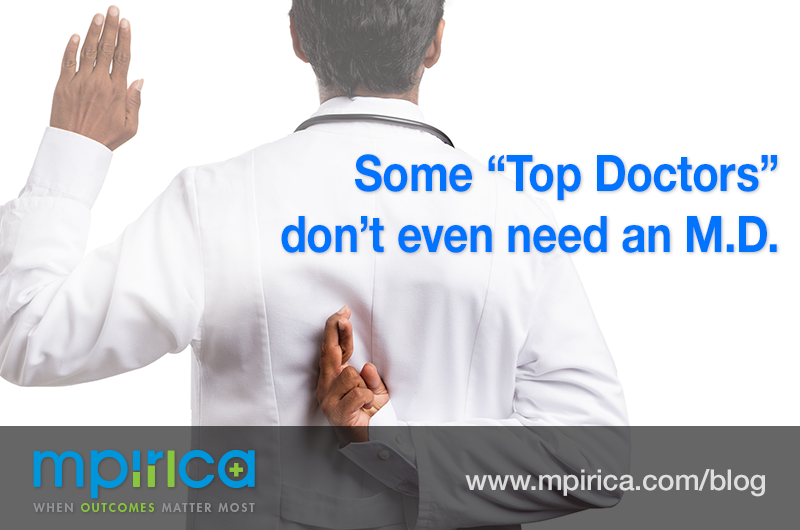 The warped incentives and broken analyses behind these ‘Top Doctor’ awards prove that they can’t be trusted. Perhaps the more troubling issue, though, is the lack of alternatives. Worthless as they are, these Top Doctor awards exist because they’re filling a void in the healthcare marketplace. Even for the seasoned experts in the ranks of insurance giants or self-insured employers, choosing high-quality providers is tough. They spend a lot of time, money, and thought on accessing and interpreting healthcare data. Even then, they don’t always get it right. If they struggle, what chance do ordinary consumers have? They have almost no hope of seeing unvarnished outcome data, let alone making sense of it. The marketplace, meanwhile, sends them contradictory signals at every turn. Health system ad campaigns and insurer referral networks profoundly influence their choices, and not always for the better. Is it any wonder, then, that consumers put some stock in glossy ads and fancy-looking awards? Can we really blame them for believing the Top Doctor hype? These awards are the symptom, not the illness. They’re the natural result of a system that doesn’t do enough to illuminate healthcare decisions. Fixing that system is why we do what we do. The MPIRICA Quality Score takes a clear-eyed look at surgical providers and judges them strictly by their objective performance. It’s outcomes we watch for, not reputations. Our AI-driven ratings system crunches billions of medical claims, uses supervised machine learning to adjust for patient risk, and achieves a truly equitable comparison of surgical performance, down to the level of the specific procedure. And we promise: we won’t be giving a score of 800 to an investigative journalist anytime soon. If you want to read more about our scoring methodology, click here.